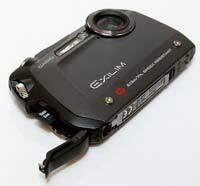 The Casio EX-G1 is the latest tough camera on the block, the first such model from Casio, and currently the World’s slimmest shock-resistant, waterproof, dustproof digital camera. Measuring just 0.78-inch thick, the all-action EX-G1 can be used at depths at 10 feet / 3 meters for 60 continuous minutes, survive falls from seven feet / 2.13 meters and withstand temperatures as low as 14°F / -10 °C. 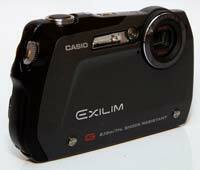 Other key features include 12 megapixels, a 3x (38-112mm) internal zoom lens, 2.5 inch LCD screen, interval shooting and multi-image capture. 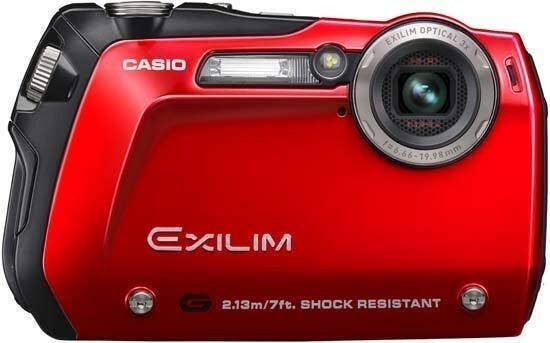 The Casio EX-G1 is available in black and red priced at £279 / $299.99. For those who like their gadgets small, slim and ever so slightly fiddly - in contrast to an exterior toughness - there's the 12.1 effective megapixel, 1/2.3-inch CCD incorporating Casio Exilim EX-G1, resembling a conventional point-and-shoot pocket camera that's had a fight with a compactor. Its body shape, wider at one end than the other, and so with sloping edges, also recalls the imperfections of Mother Nature - a discarded piece of slate or flint perhaps found on a countryside ramble, particularly in its gritty grey-black incarnation we had for review. Yet the various ultra-modernistic dials, knobs and controls give it the impression of a Swiss army knife re-imagined for a Terminator or latest generation Batman movie. So while from some angles it looks a bit odd, from others the EX-G1 appears very cool indeed. Feeling solid when gripped in the palm despite its svelte dimensions and depth of a mere 19.9mm - which Casio is claiming as the 'world's thinnest profile' - the camera is further shock resistant to drops of up to 2.17 metres (Casio's own testing), weather and waterproofed to depths of three metres for up to an hour, plus dust-proofed and freeze-proofed to -10°c, though such low temperatures will impact on battery performance. We were a little surprised to find that despite the overall rigid nature of the build, complete with industrial-style bolts on the faceplate a la Panasonic's FT1, the glass protecting the lens had been left exposed to fingerprints and fluff that quickly attached itself when fetching it in and out of pockets. Given the premium £279 suggested UK retail price (premium for a point and shoot at least), surely a slide open and shut automatic metal lens cover could have been implemented? In fairness the EX-G1 has everything else, the lens surrounded by a resin lens ring to protect from impact, plus dampened mount and reinforced glass with a multi coating to (theoretically) avoid reflection. The wide angle 3x optical zoom provided, equivalent to 28mm-112mm in 35mm film terms, is internally stacked so that at no point does it protrude from the body and so into harm's way. An acrylic plate protects the LCD from water pressure and shocks, being, claims Casio, 1.5x thicker than a conventional LCD panel. Perhaps as a hint at the kind of owner it is trying to attract to the EX-G1 - adventure sports enthusiasts and adrenaline junkies aside - Casio has opted for a microSD card beloved of mobile phone users for its chosen storage media. That's even though there looks to have been room for a conventional SD/SDHC card slot instead. Thankfully then it has thoughtfully supplied a proper SD-sized adapter to provide compatibility with older desktop card readers. This being a Casio, hand holding for those who just want to point and shoot comes in the form of its multiple Best Shot scene modes. These are individually user selectable, as well as being collectively incorporated into the camera's Auto Best Shot (BS) mode. This is presented alongside regular auto, and all are discovered with a fingertip press of the top-mounted 'BS' button, at which point the user is presented with a series of on-screen thumbnails displaying the various options so as to avoid any confusion whilst trying to navigate an alpine pass on a pair of skis at the same time. Choices include time lapse stills (at intervals of 10 or 30 seconds, one or three minutes) and movies (intervals of three, ten, 20 or 30 minutes), the common-use regulars of portrait and landscape settings, alongside snow and beach and underwater options - that's 26 Best Shot options in total if you include regular auto and voice memo mode. Movies of 840x480 pixels in widescreen ratio are Motion JPEG format with mono sound, with a continuous duration of up to 10 minutes if a sufficiently large card is inserted to expand the minimal 35.7MB on-board memory. Helpfully a 2GB microSD card came supplied with our review sample, which allows for around 20 minutes. Macro close ups down to a distance of 10cm from your subject can also be achieved - as long as the camera can be held steady enough, with mechanical image stabilisation providing a limited degree of back up. Otherwise light sensitivity is fairly broad for what is otherwise a standard-issue point and shoot compact, running from an equivalent ISO 64 up to ISO 3200. If you do take an awkward tumble with this camera there's solace to be taken in the fact that - hopefully - only your limbs will end up broken. The EX-G1 is protected by a two-layer construction that comprises a stainless steel outer body and waterproof 'inner body' constructed from polycarbonate reinforced with fiberglass to absorb impact. While the above all sounds like good news, and vaguely exciting with it, as we mentioned in our intro, operation of this Exilim is due its compacted nature ever so slightly fiddly, even without the addition of ski gloves. The on/off button is recessed into the top plate and has a ridged top to provide purchase, which is fair enough, but it is very small indeed. Next to this is the Best Shot button, which might have been better placed at the camera's rear, as several times I mistook this for the power button when my attention was focused on subject rather than camera. There's no mistaking the shutter release button however, raised a little higher and being the largest one here, inset into a circular chrome outer disc like a cog in a wheel. It is little details like this that give the EX-G1 its at once futuristic yet industrial (strength) look and feel, arguably the best thing about it. Press the power button and the camera powers up in just over a second, 2.5-inch LCD screen fading up from black to relay the image before your lens with an accompanying beep of affirmation that you're ready to frame your first shot and get shooting. Of course there's no optical viewfinder as an alternative, and, though the quality/visibility of the screen is fit for purpose there is some corner shading visible when composing pictures indoors against neutral backdrops. Go on to take a shot and, with ever so slight shutter lag in its default single shot mode, a maximum resolution Fine quality JPEG file is committed to memory in around three seconds; an average showing then. Whilst the front of the camera is an austere looking affair with lens, a barely visible pin prick housing a built in microphone, plus bright white AF assist/self timer lamp and built-in flash all featuring, once again this is a camera on which fingertips can stray into shot if the user isn't too careful, due to the lens' location at the top right hand edge of the faceplate, and the lens itself at no point extending beyond the inner shell. With the sloping top plate matching in its minimalism, it's the back of the EX-G1 and right hand edge where a rotate of a nicely chunky dial causes the catch for the cover protecting the card port to open, that attracts the user's interest. We've been spoilt of late by three inch screens on compacts so the 2.5-inch variety here feels a tad small, though as we've noted it does the job. 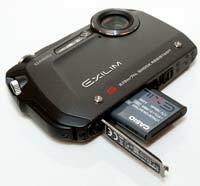 Like Panasonic's G-series Micro Four Thirds cameras, Casio here includes a dedicated record button for the shooting of videos rather than stills, the advantage being that the user doesn't have to duck out of a particular mode to select a video option - hit the record button and you're away and filming. Neat! Just below this and top right of the screen itself, standing barely proud of the body is a toggle switch for operation the zoom, square shaped pads provided for alternating between wideangle and maximum telephoto in capture mode, or enlarging portions of an image or displaying a series of thumbnails in playback/review. The action of the optical zoom is responsively swift, yet smooth and virtually noiseless, traveling through its range in a couple of seconds, with the option to extend this further into the realm of the digital zoom/crop if so desired (and implemented via the menu button). Beneath the zoom control is a slanted but otherwise self-explanatory playback button for reviewing captured images, and underneath this again a four-way directional control pad with ridged unmarked set button at its centre for affecting any changes made in conjunction with a press of the menu button just beneath. Rather than having dedicated functions attributed to its four corners as on the majority of rival compacts, here there are just markings for 'display' at 12 o'clock on the pad and a joint image delete or flash adjustment option at six o'clock. Press this central control button without pressing the menu button first and alternatively a Canon-alike toolbar appears at the right of the LCD display. This presents key shooting options running from top to bottom. As the user tabs through these choices a side bar extends from right to left across the screen showing the various sub-options for each setting. From the top, there's the ability to choose resolution and image ratio - from 12 megapixels down to three megapixel stills or VGA (640x480 pixels) video - and subsequently widescreen, standard format or Long Play video options. Next icon down, we again get a chance to adjust flash - auto, off, forced on, soft flash (for portraiture) and red eye reduction - and next choose from the self-timer options. These include two, ten seconds or a 'x3' option which counts down to the first image being taken and subsequently takes a further two shots a second apart - useful when you want to include yourself in a group photo and hedge your chances of everyone with their eyes open in at least one image. Continuing down the side toolbar we next come to the auto focus options - starting with intelligent auto focus and moving onto spot and multi area focus options, plus AF tracking for moving subjects. Next up is light sensitivity, ISO range extending incrementally from ISO64 to ISO3200, and following this, the ability to activate a record light - via the same lamp as for AF assist/self timer - very useful for shooting video in lower light. It's worth mentioning that a side press of the control pad also provides access to two in-camera digital effects: 'make up', a beauty mode type function which predictably smoothes skin on the face to give it that waxwork-about-to-melt look beloved of American fashion magazines, and 'vivid' landscape, as it sounds this is an automatic method of boosting blues and greens in an image. Moving to the base of the EX-G1 now, we find a screw thread for attaching the camera to a tripod at the far right, plus a very thin elongated flap covering the battery port dead centre. Raising this almost requires breaking a fingernail as the catch for its release is small and tight, whilst extracting the lithium ion rechargeable battery for recharging is similarly fiddly as the cover remains almost at right angles to the body leaving little room to get a pair of fingers in to retrieve it. Also tricky to remove is the microSD card from the slot at the camera's side, though this is as much to do with the miniscule dimensions of the format itself as not a lot of room provide by its surrounding features.